While time attack itself is comparable to the crucial qualifying portion of any circuit race weekend, the difference is quite drastic. A normal qualifying session is a brief time when cars, about to compete in a circuit race, execute their best lap time in order to determine their starting order for the race, which is usually much longer. This format potentially alters the necessity to set a fastest lap, if the equipment needs to be saved for the race, or if the team already knows they can perform better in the race. Whereas in time attack competition, the act of executing the fastest lap is the race, which causes an onslaught of drivers going all-out in the hopes of lap record glory. In years past, time attack entrants were reliable cars that resembled their tame road-going versions, able to spend several days circling a track in the quest of the driver’s cleanest and fastest lap. However, those days have passed, as a new breed of attackers has caught on to a realization that the cars don’t need to last long. One lap on the edge is all it takes to eclipse the all-important event victory or circuit record. Onto the event, the drivers and cars are grouped by class to keep specifications similar, but exit onto the track in run groups (A, B, and C) further designated by lap times. This prevents any unnecessary traffic due to out-classed cars. 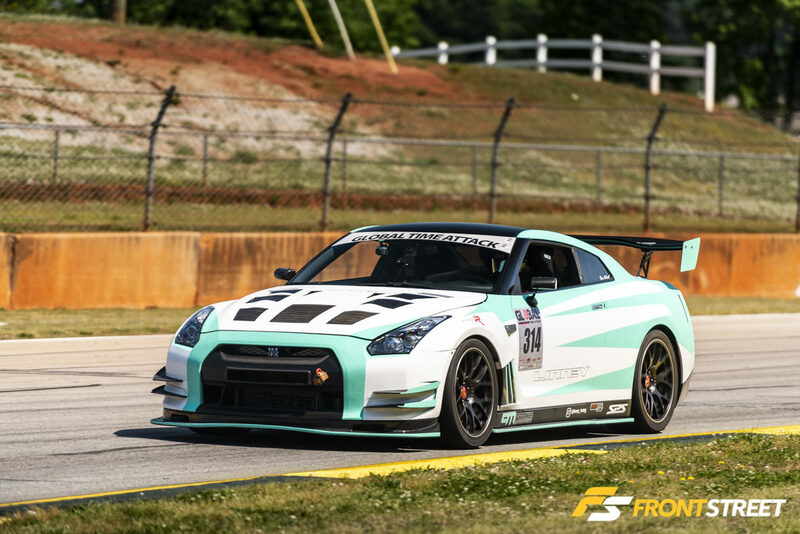 We’ll start with the Group A drivers including Ernesto Bustamonte in his Busta-Move Nissan GT-R who finished the weekend with a 1:33.569 for top honors in Limited AWD. Behind him on track was the Forged Performance Nissan 350Z of Alexander Gallardo who ran a stout 1:33.079, which was good enough for second in his Unlimited RWD class. The Canadian Chris Boersma seemed to struggle all weekend to nail a time down that was comparable to his scorcher last year. Only managing to run a 1:34.877 this year for third place in class, Boersma wasn’t able to back up his previous class-winning performance. One of the few domestic compacts of the bunch, Brian Tyson wheeled the JST Performance Focus ST to a fourth place finish in the Limited FWD class with a 1:35.083. The event’s only Pro/Comp class entry was Elliot Skeer from Savvy/SP Motorsports with his Porsche 991 GT3 Cup car. The well-equipped racecar set a quick 1:24.098, which is only a few tenths of a second slower than last year’s Pro/Comp winner. Following him closely on track was the second entry from Savvy/SP Motorsports, a non-Cup version of the 991 GT3. Adam Knapik piloted this car to a respectably fast 1:32.613 for third place in Limited RWD. 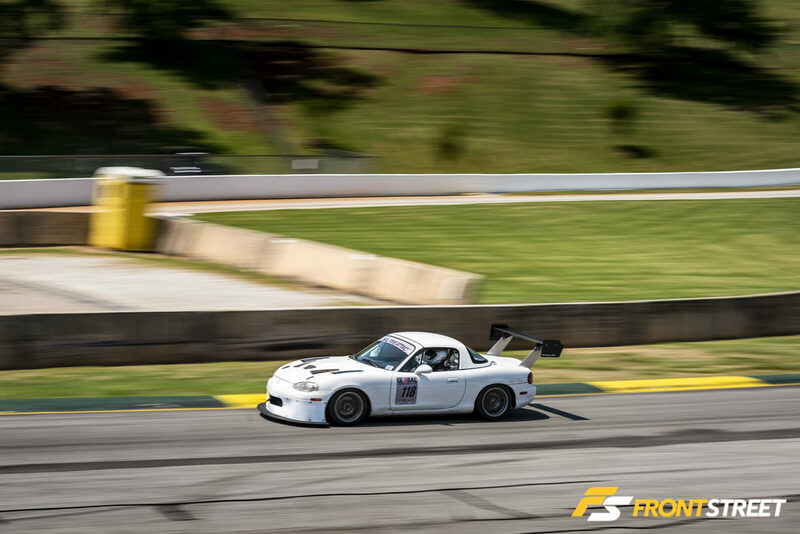 Chris Winkler took the Bilstein Suspension-sponsored Challenger Hellcat around the winding hills of Road Atlanta for an Unlimited RWD class win, with a lap of 1:32.439. This event was said to be a shakedown for the Hellcat, which will climb Pikes Peak later this summer. As the Group A session ended, the Group B and C drivers each got their chance on track for their hot laps. In Street RWD, Jackie Ding drove his Honda S2000 to a 1:38.650 for fourth in class, while Russell Floyd topped the class in his Z1 Motorsports 370Z with a 1:35.450. Two of the sport’s leading ladies, Savanna Little in her Enjuku Racing 350Z, and Sally McNulty in her Snail Performance STi, were on site all weekend and happy to take pictures with their fans, but also ripped out on track. Little, with help from Spencer Pumpelly, attacked the Esses section and squeezed a 1:35.499 for third in her Unlimited RWD class. That’s an enormous 7.7 seconds quicker than her best lap at Road Atlanta last year. McNulty, in the Street AWD class, powered her STi down the insanely steep hill at Turn 12 never lifting the throttle and crossed the line with a super quick 1:36.939. That’s more than a two second improvement over her fastest lap at this track last year. During one of her sessions, McNulty returned to pit lane where her Subaru’s engine bay emitted a large cloud of smoke, which quickly dissipated. While the Formula Drift event is the weekend’s headline attraction, the accompanying Global Time Attack event and Autocon car show bring in their own group of attendees and competitors. In a rather rare occurrence, Tae Chang is probably the only person in GTA or Autocon history who registered and competed in both in a single day, and won one. With his yellow S2000, Chang took home Best of Show in Autocon only hours after he was navigating the sweeping turns of the track in the Street RWD class of Global Time Attack. This is the type of vehicle more people should emulate. Clean and tasteful enough to win shows, yet useful enough to prove itself on the track. I was impressed! In order to finish up with the record setting pace of the weekend, I must first discuss last year. 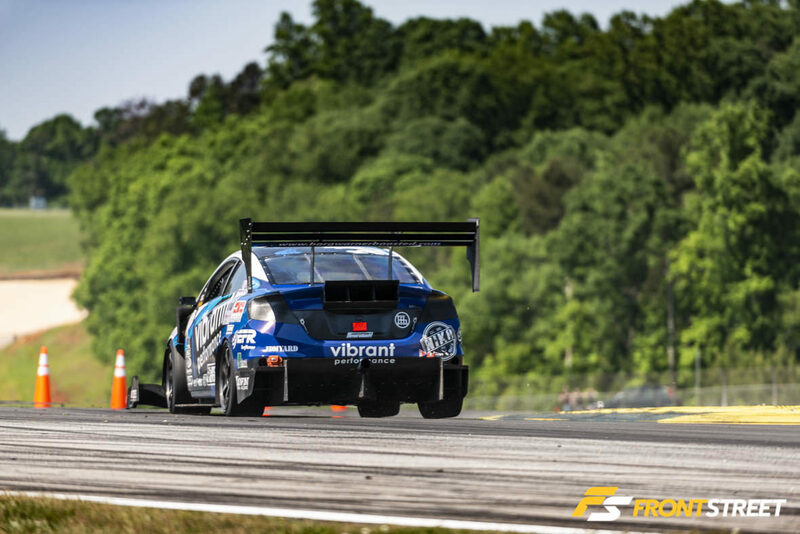 When the Road Atlanta stop of the Global Time Attack tour saw the Unlimited FWD lap record of 1:25.555, set by Chris Rado’s F-Wing Scion tC back in 2012, broken for the first time in five years. What was last year’s record, you ask? William Au-Yeung’s Vibrant Performance/PZTuning Honda Civic set a blistering 1:23.358, more than 2 seconds faster than Rado’s lap. This year, however, Au-Yeung came back with even more zeal than before. He and the PZTuning team from Canada have completely overhauled their car since their record setting year in 2017, which included a trip with the Civic to Australia to compete in the World Time Attack Challenge. Upon his return to North America, Au-Yeung renovated the Civic to fit in line with his global competition by upping its power, enhancing its on-the-fly adjustability, and decreasing its longevity to create the ultimate one lap machine. Now very similar to that of a drag racing car, all unnecessary crevices of the front end have been sealed off, except the large center opening for the intercooler. The body panels have been widened to better shape the air around the new widened stance, with other advanced aerodynamic touches applied throughout the chassis. All of this combined to create a massive performance gain over previous years. Even though it is fitted with large -12AN hoses running to various cooling aids, the Civic now barely survives the minimum warm up lap, hot lap, and cool down lap before needing rest for the remainder of the weekend. However, the results speak for themselves. 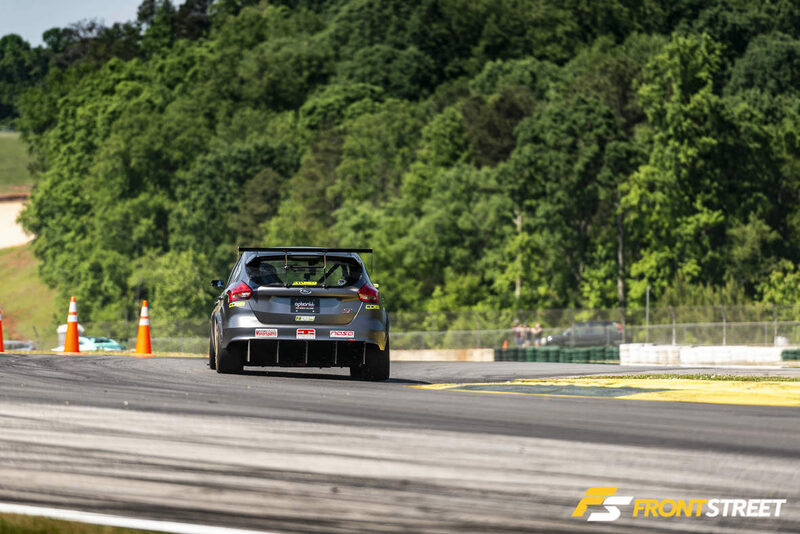 On its only run of the entire weekend, the Civic clocked an awe-inspiring 1:19.509 lap around the 2.54-mile Road Atlanta racetrack! Blink, and you would have missed it. Unbeknownst to me at the time, the car passed me at Atlanta’s famed Turn 3 on its warm up lap, and I rattled off a couple pictures. The next time the car swooped by at speed with its large front splitter sparking across the ground, yet it seemed too smooth to be a hot lap. I thought this might have been an additional warm up lap until one minute later when the loudspeaker announced not only a new Unlimited FWD record, but also a new overall event leader, and new time attack lap record. William Au-Yeung had obliterated his previous year’s record by almost four seconds! Congratulations to him and his team, who have already started prepping the car for World Time Attack Challenge competition again this year. I could be here all day discussing the rest of the entrants, as there were so many different driver/car combos running all weekend. For the remainder of the results, and a full schedule of their 2018 events, check out the Global Time Attack website. We’ll have more on GTA later this year, but for now check out our gallery below for more images. Thanks for reading!